A do-it-all quarterback from the early years of the NFL, Sammy Baugh helped move the league toward the pass-happy systems in place today. 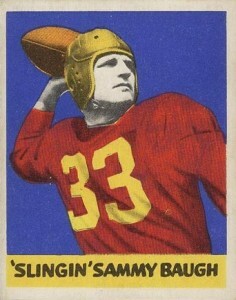 While his card options are limited, Sammy Baugh rookie cards remain popular with vintage collectors. 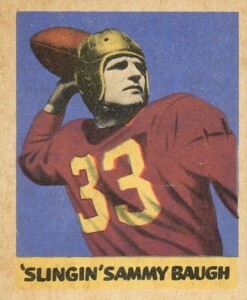 Shop for Sammy Baugh Cards on eBay. After growing up in Texas, Sammy Baugh attended Texas Christian University, where he was a standout in both football and baseball. While he ultimately chose to pursue football, Baugh earned his nickname, "Slingin' Sammy," on the diamond at TCU and even played baseball with the St. Louis Cardinals' minor league system before concentrating solely on football. 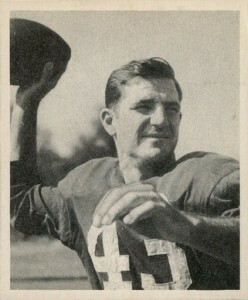 The Washington Redskins took Sammy Baugh with the sixth overall pick in the 1937 NFL Draft and he remained with the team his entire career. Over 16 seasons, Sammy Baugh was a punter, defensive back and quarterback, excelling at each position. 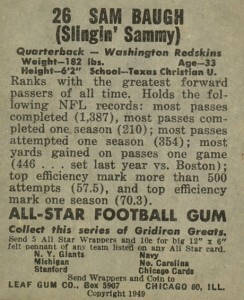 However, Sammy Baugh made his biggest mark as a QB. He led Washington to five title games and two NFL championships. A two-time NFL Player of the Year, Baugh was also named to five All-Star teams, one Pro Bowl and was part of the charter Hall of Fame class in 1963. 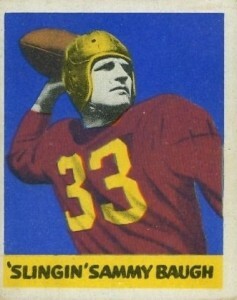 Sammy Baugh passed away near the end of 2008. Outside of a few oddball options, collectors were forced to wait nearly a decade into his career before the first traditional cardboard options for Sammy Baugh were released. 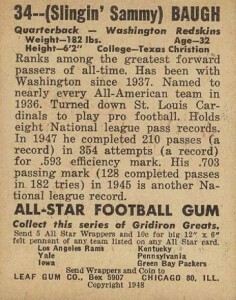 Baugh actually has two rookie cards in 1948 and a few more options during his active career. Autograph and memorabilia cards are also limited, but Sammy Baugh signed cards were available starting in the 1990s and the first relic cards were released in the 2000s. Click the images or listings to shop for cards on eBay. Simple and filled with key rookie cards, 1948 Bowman is led by the rookie card for Sammy Baugh. Like most vintage releases from this time, the cards are plagued by centering issues and aging problems with the white border. Low grades and ungraded versions can be found for under $100, but high grades remain tough to track down and a PSA 9 version sold for $6,909 in April of 2015. The black-and-white image of Baugh is a sharp contrast to his 1948 Leaf rookie card, offering collectors a reason to collect both. Bold colors and a more cartoonish design make the 1948 Leaf rookie card for Sammy Baugh immediately stand out. The card features his nickname and is available in two color variations. Both versions are identical except for the color of Baugh's jersey. The red jersey is shown on the left, while the maroon jersey is shown on the right. The card back is also available to help distinguish from 1949 Leaf. A more affordable option for collectors that are interested in early Sammy Baugh cards, 1949 Leaf includes a virtually-identical front to the 1948 Leaf rookie card. However, it is easily distinguished by the card back, shown below.